GBA Castlevania: Harmony of Dissonance (USA) "Maxim, all bosses" in 05:47.68 by gstick. This is a really fast TAS through Castlevania: Harmony of Dissonance played as Maxim, who is only available after the game is beaten. 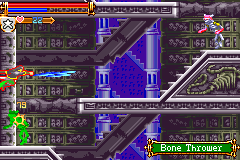 Unlike in the glitch-warped run, the protagonist doesn't directly fight Dracula and instead defeats every boss, reaching Dracula the intended way. However, this doesn't stop Maxim from making short work of every boss and sinking into walls wherever he wants. This TAS by gstick improves the prior run by 1:42.59 thanks to further optimizations and an entirely new route. Note: This movie starts where the main quest movie left off. We don't usually accept movies beginning from a save, though. Please read our rules to see our reasons.